This book traces Dàdàkúàdá’s history and artistic vision and discusses its vibrancy as the most popular traditional Yoruba oral art form in Islamic Africa. 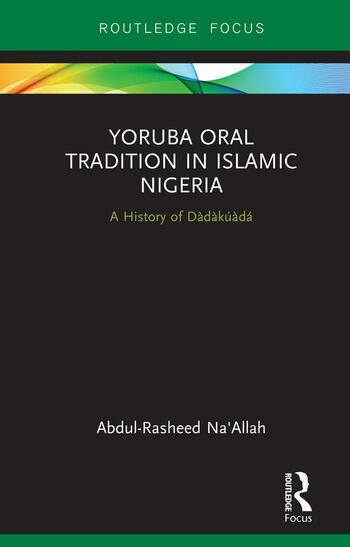 Foregrounding the role of Dàdàkúàdá in Ilorin, and of Ilorin in Dàdàkúàdá the book covers the history, cultural identity, performance techniques, language, social life and relationship with Islam of the oral genre. The author examines Dàdàkúàdá’s relationship with Islam and discusses how the Dàdàkúàdá singers, through their songs and performances, are able to accommodate Islam in ways that have ensured their continued survival as a traditional African genre in a predominantly Muslim community. This book will be of interest to scholars of traditional African culture, African art history, performance studies and Islam in Africa. Abdul-Rasheed Na’Allah is Professor of English and Comparative Poetics and Vice-Chancellor of Kwara State University, Malete, Nigeria. He is co-author of Introduction to African Oral Literature and Performance (2005), and author of Africanity, Islamicity and Performativity (2009), African Discourse in Islam, Oral Traditions, and Performance (2010), Cultural Globalization And Plurality (2011), Globalization, Oral Performance and African Traditional Poetry (2018).